What is the purpose of MissingCritters.com? To make the job of finding & reuniting a missing critter with its owner as simple, safe, and efficient as possible. Lost a Critter. When you tell us you’re missing a critter, we show you all those critters in your ZIP code that have been found. You can expand the search up to 100 miles. If you see your critter, confirm the match and we’ll either share contact info (not recommended) or send you and the finder to the closest shelter for reuniting. If you don’t see your critter, you can post the guy. It’s easy! Found a Critter. You can use your cell phone camera to send a picture to FOUND@MissingCritters.Com (no APP, smartphone or iPhone is required). You can also use the computer directly to enter info about the critter you’ve found! Just tell us what type of critter (bird, cat, dog, horse, livestock, or other) and the location the animal was found. All personal info is kept strictly confidential. Are there costs or expenses involved? No. There is no cost for using MissingCritters.com. However, there may be a cost, unrelated to the use of MissingCritters, to retrieve a critter from a shelter. Can I pre-register my critter(s)? Yes. Just go to the tab at the top of the page for "Add / Change Critters". Set the critter's status: "Keep my critter on file." If your critter gets lost, just change status to "My critter is missing". How does a shelter post strays? 1.) Create a free email address for STRAYS ONLY. Use Gmail, Yahoo, Hotmail, or your own in-house email service provider. 2.) Establish a shelter account in MissingCritters.com. Click the ADD/CHANGE CRITTERS tab above and follow directions. IMPORTANT - You must click the CHECK BOX for Animal Shelter and enter all contact info. The new email address must also be your password. 3.) Add your new email to cell phones to be used for posting strays. IMPORTANT - Phone handlers at the shelter or in the field must make sure to use the NEW email for posting strays if the phone has other email accounts. Send Image of Stray – Photograph stray with cell and send to Found@MissingCritters.com. In the subject line or message include the animal type (i.e., dog, cat, horse, bird, livestock or other) and a ZIP Code where found or ZIP of shelter. How it Works – Emailed photo is immediately posted. When a stray is ID’d by its owner, shelter location is provided. It is the owner’s responsibility to act on this information. Does participation mean extra work? Is there a “hidden” cost? It’s 100% TOTALLY FREE. The “extra” work is simply to “aim and click” a cell phone. Critter postings are removed automatically after one week or when ID is confirmed by owner in MissingCritters.com. Why should animal shelters participate? To improve return-to-owner rates! It is by far the most desirable way for a shelter to reduce its stray population. We create a 100% FREE "window to the world" for shelters and owners. 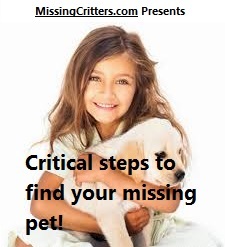 Is MissingCritters a shelter management system? Can it be used for adoptions? No, MissingCritters is strictly a lost and found. Strays are only temporarily stored while they are in a shelter or in the possession of someone who finds a stray.